Questo tour a piedi di Lisbona per famiglie ti presenta i monumenti storici e le attrazioni principali del centro città. Potrai passeggiare attraverso più "bairros", o quartieri, e fai un tradizionale giro in tram con una divertente guida durante questo tour di 4 ore. Ascolta il commentario adatto ai bambini su re, regine e castelli, mentre ascolti le leggende della città e scopri le sue particolarità - perfetto per i visitatori che vengono per la prima volta! Rita was our tour guide. She was an amazing. Our daughter loved the tour and Rita , so did we. We got history lesson and good exercise, both for our bodies and mind. Rita had a bag with unknown objects. Our daughter had to guess what the unknown object was. Next came history lesson tied to the object. In one neighborhood we were left alone with clues how to get to special meeting place. We did it. At the meeting place we got a reward of traditional warm Portuguese custard cakes with cinnamon. A few days later we run into Rita at the Lisbon Aquarium. She-marine biologist- is a guide there. She was nice enough to give us a quick tour of some of the tanks. We hope to stay in touch and see each other again. Wir können diese Familientour nur empfehlen. Besser kann man Kinder bis 14 Jahre nicht für die Sehenswürdigkeiten von Lissabon begeistern. Sowohl unser Guide als auch die Kinder hatten Spaß. Arranged for cruise terminal pick up to try to avoid dealing with getting the to meeting point in a strange city. Had prompt and courteous for the arrangement. When we arrived, we couldn't find any one at the terminal. Called the number and immediately reached someone in the office who called the guide right away and got back to us. Turned out she had gone to another exit where another arrival cruise ship docked. She came over right away and apologized. the tour started without further problems. 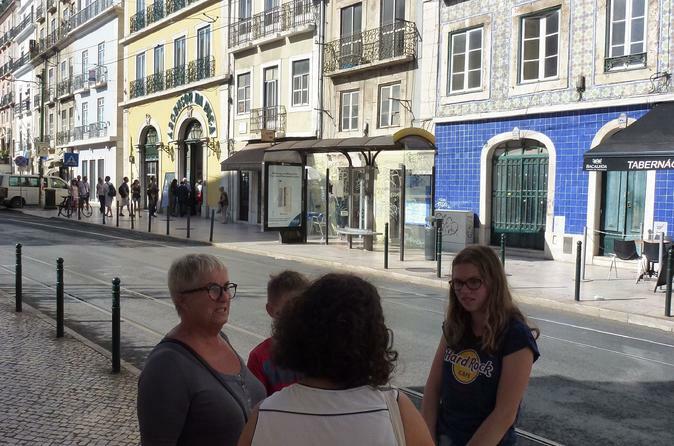 The tour was good, designed with children in mind but equally interesting for the adults in the group, with emphasis on Lisbon/Portugal's culture and history. Luciana the tour guide was very nice and patient. We have a 9 yr old and 5 yr old. Both loved it, especially the labyrinth race. Had good recommendation for lunch at the end of the tour. A very nice day in Lisbon! would definitely recommend it for families with kids and would book them again for another tour they have multiple offerings if we visit Lisbon in the future. The tour is very well designed to be suitable for the children. My daughter was very engaged in the activities. We also got chance to know Lisbon better. We had an excellent tour with Mariana. She kept our three children interested the whole tour with direct interaction and involving them the whole time. We all enjoyed the tour. The ride up the hill in a tram and the treasure hunt/ Map quiz was great fun especially since we split into boys and girls teams. Girls won and we were all rewarded with a lovely egg custard tart. The personal tour I think works really well especially when I saw bigger groups walking around i was relieved it was just the five of us as a family. We saw all parts of Lisbon from the central square down by the river and the market up through the high neighbourhood and the stunning view back down into the square near the train station. I would highly recommend the tour and Mariana is an excellent guide who keeps the children interested. Little Lisbon Tours with Maria was excellent. We picked the Essential Lisbon tour which focused on symbols. Maria was friendly, knowledgeable, and great with our shy 8 year old son. We learned lots about the city and felt confident to navigate and explore on our own after her introduction. She showed us places that we may not have found otherwise. The tour included trivia, scavenger hunts, a tram ride, and a special snack. Highly recommend!! Never taken your children on a City Trip? Then this tour is the right thing to do. We arrived the day before and walked with the kids 6 and 8 around town, it was a nightmare. 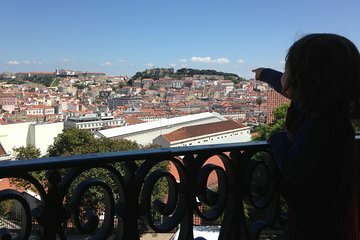 Thankfully, we booked Little Lisbon for the Family Tour the next day and the kids suddenly had a change of mind. Mariana had games, clip boards and check-list prepared. She was super patient with the children and made it easy for them to understand the history of Lisbon. Even in the days to follow they still keep going with the spotting games and retold the Stories Mariana told them. Our tour started near the Praca do Comercio, heading towards the Market for a snack and a coffee. We took the Tram to the upper Parts of Lisbon VERY steep hill and had a very cool Family Challenge in Bairro Alto. We finished our Tour at the Praca Rossio with another game!